The aim of the competition consisted in the expansion of a school building on the outskirts of Frankfurt built in the 1920ies. The existing building, which is under protection, could not be modified externally. The area of intervention, therefore, consists only in the backyard, without affecting a small park of chestnut trees. The concept consists in keeping the visual and physical connection between the courtyard and the park of chestnuts trees, avoiding to put the extension as a barrier that risks to separate the two areas. The suspended volumes reproduce the configuration of the close urban areas, consisting of insulated blocks. In this way, the urban composition theme blends with the architectural one. The visual separation of the volumes does not correspond to a physical separation of the spaces. 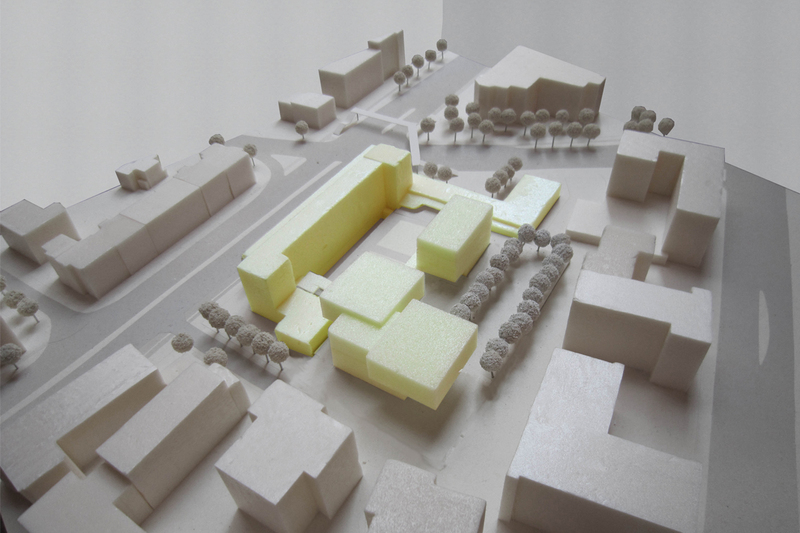 In the basement level, in fact, where is set the sports hall, are set also passages which connect all the pavilions, while in the courtyard level a shelter provides a secure link between them and the existing building.